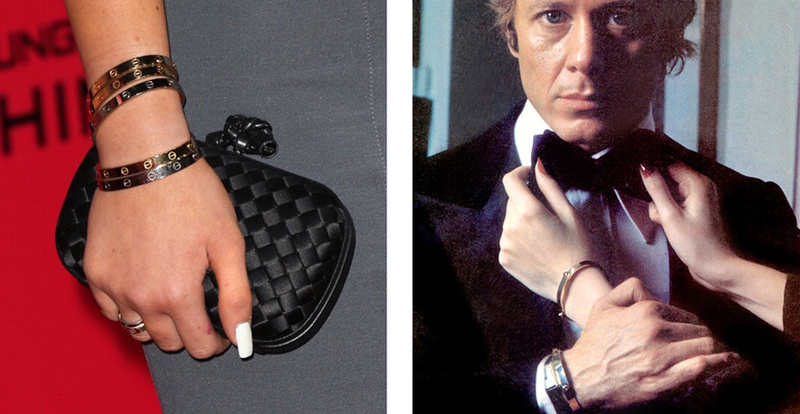 Cartier’s Love bracelet is so ubiquitous on street style stars, frequently flaunted by social media mavens and often seen on the ladies of the Kardashian clan, it might be hard to believe the design is almost 50-years old. Yet it’s true. In 1969, the same year Cartier made history when it acquired and sold a 69.42-carat diamond to Richard Burton for Elizabeth Taylor, it also launched the Love bracelet. The iconic jewel was conceived by designer Aldo Cipullo at the Cartier-New York Mansion on Fifth Avenue. Cipullo designed the narrow gold bracelet in the shape of an oval to fit snuggly around the wrist because he believed “Jewelry should be part of the body.” Bold screwhead motifs punctuated the surface and one worked as the clasp. A small screwdriver that accompanied the jewel was used to tighten the screw and fix the bracelet somewhat permanently on the recipient’s wrist. By the time Cipullo joined Cartier in New York, he had an impressive resume that stretched back to his teenage years in Rome working for his father Giuseppe’s eponymous costume jewelry company. The senior Cipullo was a task master who made sure his son knew the business inside and out. This experience was followed by a formal education in Florence. Post-graduation he took an extended American vacation visiting over 30 states. Shortly thereafter, he decided to make his home in New York City. “All the talents are here,” is how he explained his decision to move to the Big Apple. 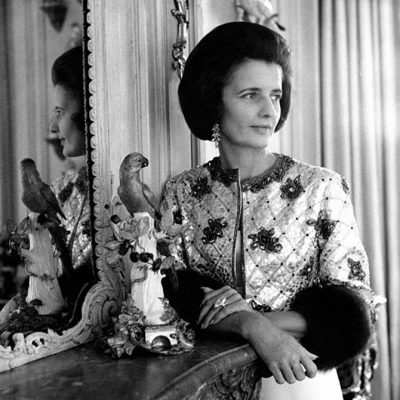 “There’s a sparkle, a fire.” After working for David Webb and Tiffany, Cipullo went to Cartier. The Love bracelet was the very first thing he created. Many high-profile people took the new Love bracelet idea of never taking off their jewel seriously. Elizabeth Taylor did not remove her Love bracelet from Richard Burton for a sitting with photographer Cecil Beaton when she was covered in diamond jewelry and formally dressed for the Rothschild’s 1971 Proust themed costume ball. Ali MacGraw had on a Love bracelet from her husband producer Robert Evans throughout the 1971 action film The Getaway co-starring her next husband Steve McQueen. In a famous shower scene, the Love bracelet is all MacGraw wears. Cipullo’s Cartier jewels are listed in the credits of the 1973 Academy Award winning thriller The Exorcist. Leading lady Ellen Burstyn sports a Love bracelet and another Cipullo design for Cartier, a large gold Hamsa pendant to ward off evil. 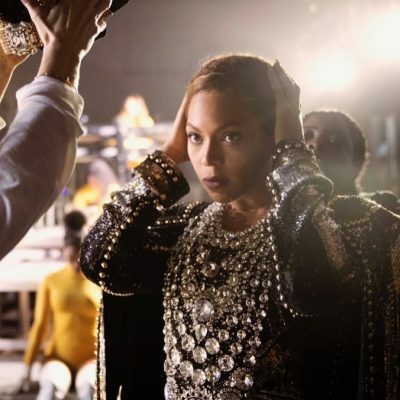 When Revlon executive Frank Shields—actress Brooke Shields’ father—exchanged Love bracelets with his second wife Diana “Didi” Lippert instead of rings in 1970, the shift in jewelry gave rise to the question in the media, “Will the Love bracelet replace the wedding band?” Even the Duke and Duchess of Windsor exchanged Love bracelets in the seventies proving the style had captured the hearts of all generations. 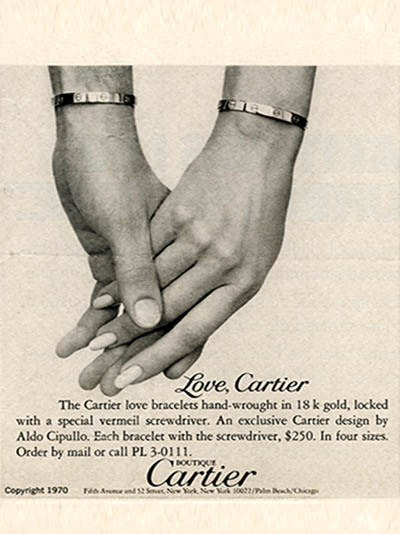 Flash forward 47-years and the meaning of the Love bracelet has changed. Now the symbolism isn’t just a romantic gesture. Ever since Cartier’s 2012 exhibition, Cartier and Aldo Cipullo: New York City in the 70s staged at the flagship Mansion with a storyline written by yours truly, the piece has experienced a massive resurgence in popularity. 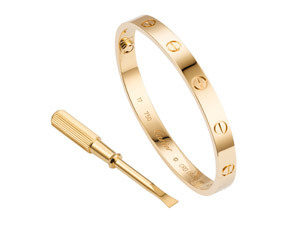 A recent survey of Google searches for designer jewelry by an e-commerce company named Karus Chains found that the Cartier Love bracelet was searched on average 353,840 times monthly, over four times more than the next item on the list, the Tiffany engagement ring. In this new era the meaning of the Love bracelet has shifted. It is not exactly about romance anymore. Today it’s about love of the Love bracelet. In other words people, particularly the Kardashians, don’t just wear one but stack as many as five on their arm to make a sweeping style statement. Cartier’s got the look covered (of course) with a stylish new piece that looks like a pile-up of seven bracelets but is actually one big Love jewel.